WHAT IS THE SOCIAL STATION? 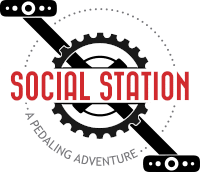 The Social Station is a Mega Cycle (party bike) that provides an innovative, Eco-friendly transportation alternative for exploring the greater downtown area of Appleton while socializing, enjoying the outdoors, sight-seeing, and staying fit. During tours, there are between 2-3 local destinations, including but not limited to pubs, craft breweries, restaurants, coffee houses, shopping boutiques, parks, art galleries, museums, and other great local attractions. Every tour is staffed with a trained driver who is responsible for ensuring the fun and safety of passengers during the ride. The tour is a great entertainment service for craft beer tours, narrated history tours, singles-mingle events, birthday parties, bachelorette/bachelor parties, fitness expeditions, mystery tours or scavenger hunts, at the coolest places in Appleton. Wisconsin. If you and your friends, family or co-workers are looking for something fun to do, try the Social Station. Our mission is to create unique, memorable and enjoyable group cycle experience. One that promotes active living in a healthy and socially responsible manner while adhering to the highest safety standards. The Social Station intends to be the premier attraction in Northeast Wisconsin and eventually become the preferred activity for sight-seeing and entertainment and group activities. The Social Station is more than just a tour, it's an experience. It's designed to be safe, unique, enjoyable and memorable for your group. 15-Rider, pedal-powered vehicle, with automotive chassis, suspension, steering, brakes and drive train. The Social Station can be rented by private parties on an hourly basis and requires a two-hour minimum. We prefer a minimum of 8 passengers and a maximum of 15 passengers. Our guests select their tour, play their own music via Bluetooth or choose from one of our many playlists. A driver/guide is included and will work with you to help make your ride a memorable experience. Any group activity, any occasion, we will make it a memorable experience.